Soups are a go to weeknight meal in our household, especially in the cool autumn and winter months. Come spring we eat a lot more salads and once the hot humid summer rolls around we practically forget all about soup. I’m thinking I need to change that this year and get creative with some cooling summer soups and gazpachos. In the meantime spring is in all its glory these days and today I’m sharing a soup to celebrate this season. It’s green, it’s fresh, it’s bright and it’s topped with more green, like spring in a bowl. It’s loaded with goodness from leeks, peas, mâche and sunflower seeds and topped with crispy roasted edamame beans and crispy leeks. Before we get to the recipe, let’s take a closer look at the wonderful nutritious ingredients that make up this soup. Green Peas are in their full glory in May and June, nut here in Italy some delicious peas can be found as early ad April. Peas are actually a legume, not a vegetable, and are a low calorie nutritional powerhouse. They are an excellent source of both soluble and and insoluble fiber, protein, vitamin K, C and A, Folate, as well as the B complex vitamins. They are also am excellent source of many minerals, namely manganese, phosphorous, mangnesium and iron. They are an excellent immune boosting food, help lower blood sugar and cholesterol and can be used as a treatment for ulcers when puréed. However, they apparently contain an anti fertility compound called “m-xylohydroquinone, so it may be wise to avoid them if you’re trying to become pregnant” according to Phyllis A. Balch, in “Prescription for Dietary Wellness”. Mâche also known as Lamb’s Lettuce in English, or Songino in Italian is a delicate salad green that’s perfect in salads and smoothies, which is the most common way to eat it. It’s a household staple here in Italy and readily found in most supermarkets and I’ve heard that it’s starting to gain popularity in North America as well. It’s the most nutrient dense salad green and is an excellent source of Vitamin A, C and B6 and a good source of iron (almost as much as Spinach) and potassium. The flavour is bright and delicate and lies somewhere between watercress and spinach. 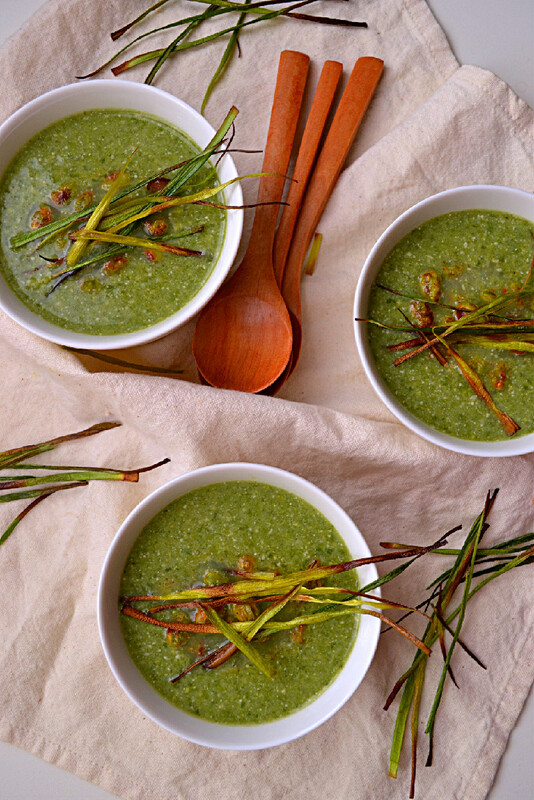 Leeks are a wonderful addition to soups. They add a nice sweet onion like flavour without over powering the flavours. Here they also get roasted, which brings out their sweetness even further, making them a perfect topping for this creamy green soup. Leeks are an excellent source of vitamin K which is essential for blood clot formation, and a good source of many other vitamins and minerals. Sunflower seeds, while not necessarily a spring ingredient, are nutritious nonetheless. They are packed with are a great alternative to nuts for those who are allergic and make a wonderful thickener and flavour booster in soups. Edamame beans or fresh soy beans in a pod are an excellent source of iron, fiber, protein as well as a good source of vitamins A and C and Calcium. They are usually boiled in their pod and then shelled and eaten as a snack, as you may have seen or eaten in a Japanese restaurant, but they also make a wonderful topping to salads, noodle bowls and stir fries and soups. Here they shelled beans are seasoned and roasted until they are slightly golden and crispy on the outside. If you have a soy allergy or aversion, you can always replace them with chickpeas. Recipe & Photography by Nissrine @ Harmony à la Carte. 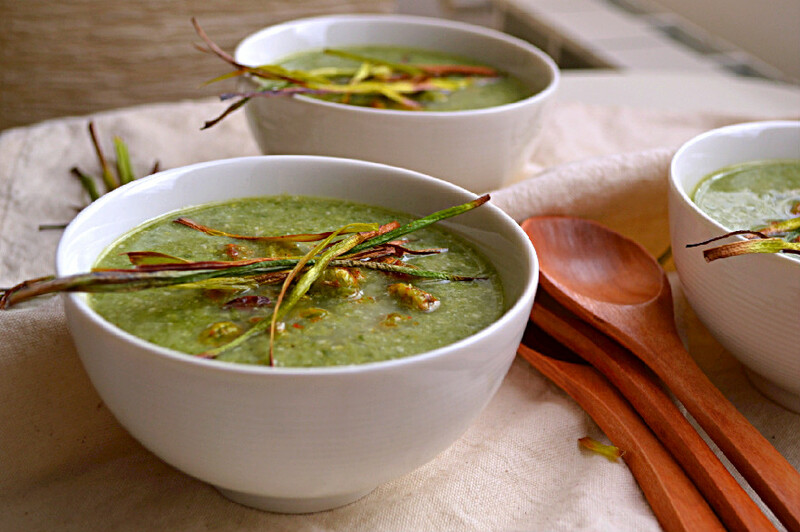 This soups is spring in a bowl and loaded with nutrient dense ingredients like peas, leeks, mâche greens and ground sunflower seeds and topped with crispy leeks and crispy edamame beans for added protein. It’s light, fresh and bright and a perfect starter to a spring meal. Shell peas and slice leeks into rounds, white and light green parts only at this step, set aside the dark green part for later, leave them whole, do not slice into rounds. 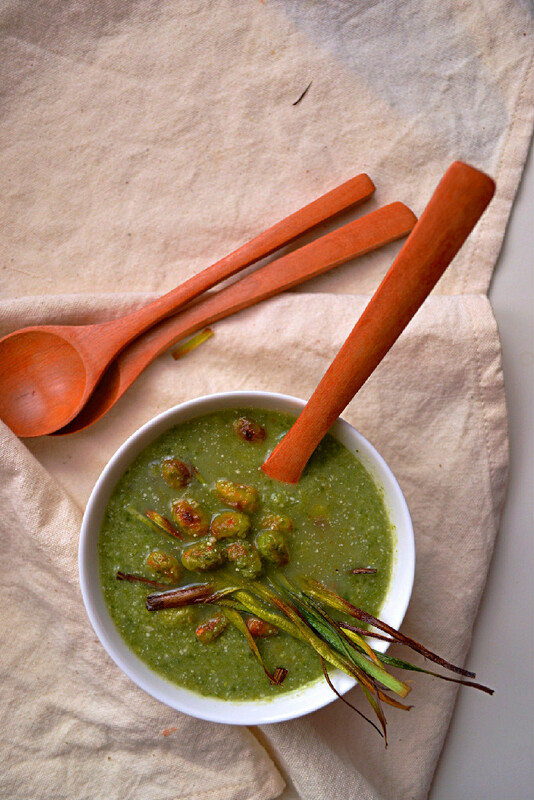 Sautee leeks, peas and garlic in water or coconut oil, with Herbamare, until softened. Add 3 cups of water, bring to a boil then reduce heat to minimum, cover and simmer for 15 minutes. Meanwhile, prepare crispy leeks and edamame beans (see method below). Once 15 min have elapsed, remove the soup from heat, add mâché and stir until wilted. Use an immersion blender to puree into a smooth liquid (or transfer to a stand blender if you prefer or don’t have an immersion blender). Add ground sunflower seeds (I use a spice mill to grind my sunflower seeds to a flour) and continue to puree/blend the soup until smooth and thick. Reheat if necessary, then add fresh ground black pepper and lemon juice and stir to combine well. To serve, top with crispy leeks and edamame beans (see steps below). Preheat oven to 200 C and line two baking sheets with parchment paper. Slice the reserved dark green parts of the leeks into long thin strips. Toss with coconut oil and Herbamare and roast on bottom rack for 12-15 min, watching them carefully so they don’t burn. Toss edamame beans with coconut oil, Herbamare and paprika and roast on center rack for abour 25-30 minutes, just until browned and crispy outside. Again, be careful not to burn them. Thanks so much Audrey. I’m looking forward to your feedback about it.